General information to do with the PlayStation 1 Hardware. Including modchips, pinouts, rare or obscure development equipment, etc. Does 4-pin install modchips in PU-18 could affect reading discs? If yes, then switching to let's say Mayumi with stealth would "fix" this? Also, I have a PSone with PM-41(2) board. I've tried to install a modchip but something went wrong. Right now console's behaviour is like it didn't "noticed" disc. Laser try to focus, CD spins for two-three times and stops. There's no "Please insert PlayStation disc". Just menu. For now modchip is desoldered, and every solder point was cleaned. 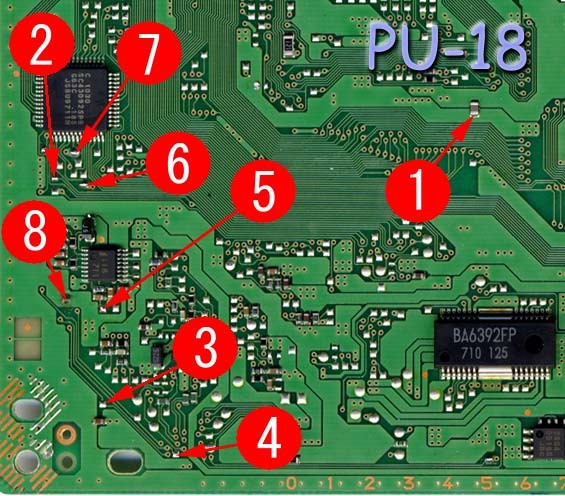 The short answer is that on a PU-18 the modchip shouldn't interfere with reading the disc. On the older boards (PU-7, PU-8, PU-18, PU-20) the output data from the modchip is connected directly to the mechacon MCU as a digital signal and no connection is made to the analog side of the circuit. The only thing you need to watch (especially with the stealth modchips with more wires) is to keep the wires away from the low-level signal processing parts of the circuit (OPU connector, RF amp chip, etc). With the later boards (PU-22, PU-23, PM-41), the pin carrying the wobble signal was deleted and the signal was carried as part of the subcode from the integrated CD/Audio IC - as a result, the modchips were modified to inject the wobble into the analog part of the tracking servo - this does have the potential to interfere with CD operation, and is most likely to do so when using the old three-wire + link install. The PM-41 uses the same approach, but the PM-41(2) has a reputation for being especially sensitive. Thanks for answer and clarify. Based on this diagram, where's best place to put modchip? Okay, I have installed Mayumi. Modchip works as intended, booting everything. But there's still problem regarding playing games. After ten minutes or so, fmv and music starts to stutter. Problem is, that this happens only on burned cds. Also load times are longer. Original games works ok. I moved laser unit (entire drive to be precise) to other console with same motherboard. And on other motherboard everything works as it should. What's going on? As stated before I have PSX 5502 and right now also PSone. So, I've burned two discs, both Sony Lead Data from Japan with 8x and 16x. 8x works good on PSone, nothing skips etc. On PSX however after some minutes game tends to load slower and stutter videos. I've moved ADM from 5502 to other 5502, and there everything was ok.
Now 16x. It works ok in 5502 (mine, not other). Also I have a feeling that even PSone loads faster that disc. TriMesh told me that 5502 issue could be caused by not enough power. Could recapping CD subsystem help here? Or I just need new laser to bring it back? It's best to stick to 8x for burning and make sure you are using a good burner and decent quality discs. Sometimes you can get away with faster burn speeds but it could cause more ware on the PS1's laser and kill it faster as a result. I have a LG 24x model DVD burner (there are actually several models that fall under that category but it's basically a line of their 24x speed DVD burners with varying models) I've been using for all of my console burns for years now and as a result am now on my 3rd drive due with how much ware I keep putting them through (the drives cost less then $20 so it's not too bad when I have to buy a new one) and I use Memroex brand discs (though Verbatim is also usually recommended but I personally don't like the label on them with only a few lines to write stuff compared to the nice clean label surface of Memorex discs). As long as you aren't using whatever no name drive came with your computer (especially with laptops) you will usually get some decent burns that picky consoles like the PS1 should be able to read without issues. The PSone's laser is actually a lot better then older PS1 consoles so it could very well be that your burn isn't quite up to the standards that the 5502's laser is able to handle well. If trying a better burner and/or better discs isn't working then I would lean towards looking in to a new laser though with your originals still working it's hard to make that leap to the laser going out just yet so I guess that decision is all up to whether you think it's necessary or not. Note I do not claim to be an expert and everything I've said up until this point is solely based on my own personal experiences when dealing with running burned games on several modded PS1s so take that for what you think it's worth.